Dinmukhamed (Dimash) Akhmetuly Konayev (Kazakh: Дінмұхаммед (Димаш) Ахметұлы Қонаев; Russian: Динмухаммед Ахмедович Кунаев), born 12 January 1912 [O.S. 31 December 1911] in Verny, now Almaty, died 22 August 1993, was a Kazakh Soviet communist politician. 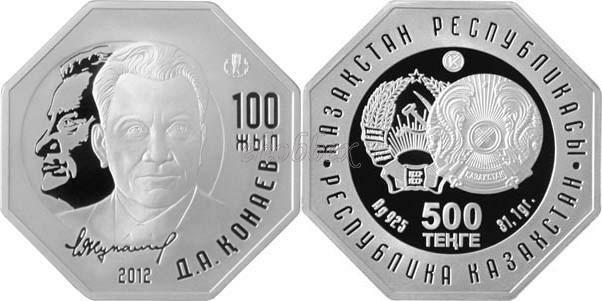 State Emblem of Republic of Kazakhstan and State Emblem of the Kazakh Soviet Socialist Republic, face value of the coin «500 ТЕҢГЕ», metal of the coin «Ag 925» and its weight «31,1 gr.», a trade mark of the Kazakhstan mint, inscription «ҚАЗАҚСТАН РЕСПУБЛИКАСЫ» in Kazakh and «РЕСПУБЛИКА КАЗАХСТАН» along circumference. portrait of Dinmuhammed Kunaev against his stylized half face, signature of Kunaev under the main image, year of issue «2012», an inscription «100 years of Д.А. ҚОНАЕВ», and a logo of National Bank of Republic Kazakhstan.